Cartoonist Andrew MacLean (ApocalyptiGirl) brings the critically-acclaimed indie hit HEAD LOPPER to Image Comics. In HEAD LOPPER #1, mighty swordsman Norgal and his unlikely companion, the severed head of the blue witch Agatha, have been summoned to the Scottish Isle of Barra to rid the town of the sea monster plaguing its shores. But what the duo did not intend is to find a much more sinister and ancient evil. The two now face a series of trials that will test both their strength and their faith. Even if they survive the island, can they survive each other's company? The dark humored quarterly adventure begins with a double-sized first issue, with 80 pages of story and a premium pin-up gallery for the regular price of just $5.99. 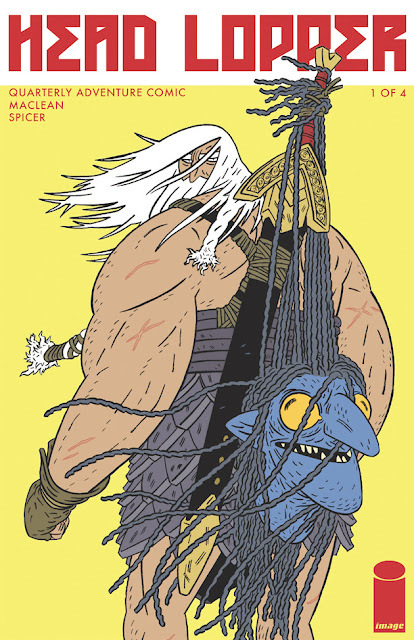 HEAD LOPPER #1 (Diamond Code: JUL150559) will be available on Wednesday, September 9th. Cover B by Rafael Grampá will be available with Diamond Code JUL150560.